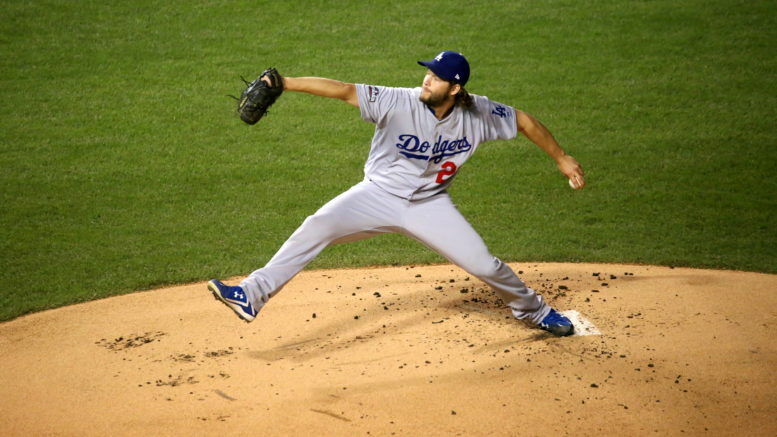 Dodgers starter Clayton Kershaw delivers a pitch during NLCS Game 6. The 2017 World Series began last night in Los Angeles with the Dodgers beating the Houston Astros 3-1. The Dodgers win was headlined by a dominant 7 inning outing from their ace, Clayton Kershaw, who struck out 11 Astros while issuing 0 walks. Kershaw is widely regarded as one of the best pitchers in baseball, and his outing last night only further established that reputation. What most don’t know, however, is that Kershaw is also a committed Christian. Other than a Bible verse reference (Colossians 3:23) in his Twitter bio, he rarely speaks publicly about his faith. But back in 2012, Kershaw sat down with I Am Second, a Christian advocacy organization dedicated to sharing stories of public figures who put Jesus first in their lives. When Kershaw was just 10 years old, his parents got divorced. Kershaw’s world was turned upside down, and the years afterward were full of daily struggles with anxiety and depression. Due to financial hardships, he didn’t think he would be able to afford to go to college. But in his senior year of high school, Kershaw began to make a name for himself on the baseball field. He went 13-0 with an ERA of 0.77 and struck out 139 batters in just 64 innings of work. In the 2006, the Los Angeles Dodgers drafted Kershaw 7th overall, and his professional baseball career began. Kershaw says that day changed his life. Kershaw says he “never thought in a million years” that he’d get to play professional baseball. But even as one of the top players in the game, he has kept his focus on what matters. “If you’re playing baseball, why are you playing baseball?,” Kershaw asked. “Is it to have success on the field and be a Hall-of-Famer or whatever it is? Sure, that’s everyone’s goal. But then what? “For me, it’s about the legacy you leave off the field. It’s about how many people I can affect through the platform He [God] gave me,” Kershaw said. Clayton and his wife Ellen started a mission to Zambia, and raised funds to build an orphanage named “Hope’s Home,” after an orphan they met on their first trip to the impoverished country. Kershaw says it can be a challenge to create change in a place where so much needs to be done. But again, he says the secret is letting go of control. God was clearly with Clayton Kershaw last night.